1. Expanded Caravan/Inventory - Increases Caravan and Inventory space. 3. Invisible Markers - makes ingame markers invisible for those who use camera mods. 4. Character Retextures - changes the looks of player characters and adds new outfits. 5. Pack Animals - allow the player to summon pack animals, which act as portable caravan drivers. 8. Tweaked UI - changes some of the interface elements, adds new fonts and text colors. - Fixed female anouran bracelets using the wrong mesh. - Fixed Onslaught rings not increasing right (rings 4 and 6 were switched). - Fixed Dream Mastery pane (the description inside the Mastery) having wrong tag. - Bags are now bigger. - New health and mana bars. - Changed some of the resistance icons to Grim Dawn ones (for fun), others have reworked visuals. - Chests have light yellow (khaki) color now to be recognizable in the sea of yellow items. - Tweaked colors of most UI text. - New fonts - work both for English and Cyrillic text. - Added 2 optional main menu screens. - Changed both player characters dual ranged run animation to normal dual wield run. - Decreased speed of Call of the Hunt special animation. Now horns from skills are visible. - Added new effect for character level up. - All monster infrequents (MI) items dropped around the world now have visible affixes. - Added more visible sparkle effects for rare, unique and legendary items on the ground (thanks to Bumbleguppy). - Prefixes giving +1 to a certain Mastery (Warrior's, Hunter's, Defender's, etc) are made green again. - Changed visuals on some rare MI items (if you played Legion of Champions mod, you may recognize them). - The unique spartan shield Aegis of Laconia has new visuals. - Wooden reinforced bucklers have new visuals. - Added my Alternative Music Mod (easy to diasble if you dont like it, view ReadMe). - General Leonidas gives a special reward for defeating Nessus. - First quest (saving the horse) now gives a small reward. - Added optional Xmax versions, which can be played from the main game. Info on how to install is added inside the mod's Database folder. - All ingame markers are made invisible, if you happen to use a Camera Mod. - Added new type of amulets - Whistles, which allow the player to summon a pack animals for a quick access to the caravan from any place in the world. - Potions stack limit increased to 50. - Scroll stack limit increased to 20. - Added new unlockable codes (I wont tell them tho, they are for testing only). If you have another suggestion for a feature, let me know. Same applies for GoG, just copy the files from the extracted archive location to your main game root folder. 2. 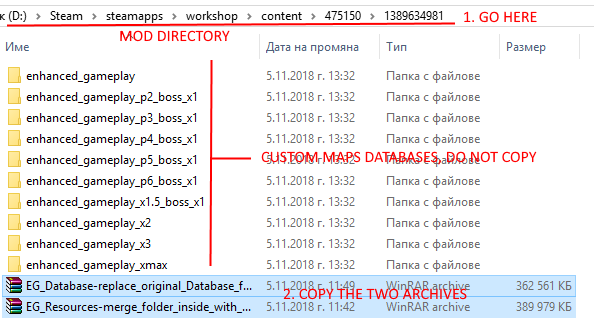 Backup/rename your game "Database" folder and replace it with the Database folder from your downloaded mod directory - "Steam\steamapps\workshop\content\475150\1389634981" (for GoG is just your AE installation folder). 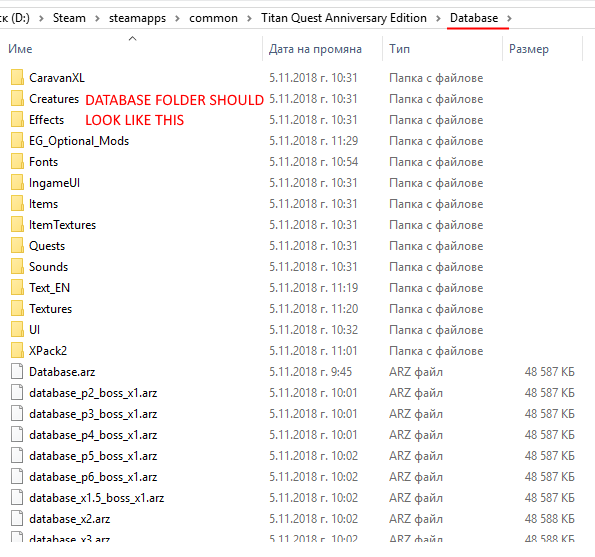 If you want to go back to vanilla game, switch the Database folders again. 3. In Windows, go to "My Documents\My Games\Titan Quest - Immortal Throne\SaveData\Sys" directory. Delete winsys.dxb and winsys.dxg in the Sys folder and any mod folder you have inside. This will unlock the increased caravan space. 4. Play normally from the main game and enjoy. Note: You need to do step 1 and 3 only once, when first install the mod, after that the new storage space is unlocked. Step 2 you have to do every time when the mod is updated, so you can play the latest version. If you enjoy collecting precious loot, but always lack space... If you hate teleporting to the vendor or caravan driver every five minutes... this mod is for you. CaravanXL expands vanilla caravan from 240 to 360 squares, fully unlocks transfer stash, adds two more rows to character inventory and makes bags bigger, for a total inventory space of 294 squares (compared to 200 for vanilla). - Reworked inventory for more balanced positioning of items in equip slots. - Added more noticable sparkle effects for rare, unique and legendary items on the ground (thanks to Bumbleguppy). - Added new health and mana bars. - Added new fonts - work both for English and Cyrillic text. - Added my custom reskins for male and female character, found here: https://titanquestfans.net/index.php?topic=32.msg1392#msg1392. To see the change, use a dye from a vendor. Female skins are coming soon. - Fixes for some vanilla glitches on textures and effects. - Integrated Xmax as a separate version (included in the pack). 1. Empty your transfer stash and storage area for all your characters (also in custom games - otherwise the items may be lost). It is advised to use TQVault just in case. 2. Go to "My Documents/My Games/Titan Quest - Immortal Throne/SaveData/Sys". 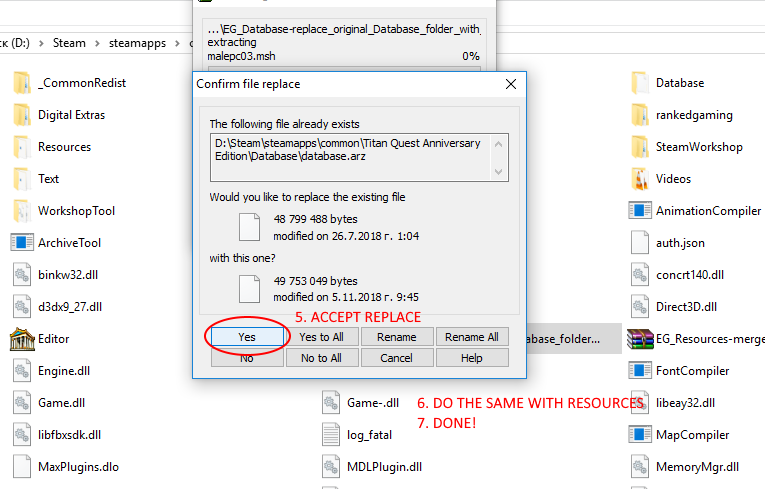 Delete winsys.dxb and winsys.dxg files in the main Sys folder and in any custom mod folder you have inside (don't worry, the game will automaticaly create new ones). Now your additional space is fully unlocked. Enjoy! Caravan adds extra character skins that aren't native to the vanilla game. If you don't want your character to show missing textures every time you relaunch the game, I'm adding an optional skin addon pack for download. 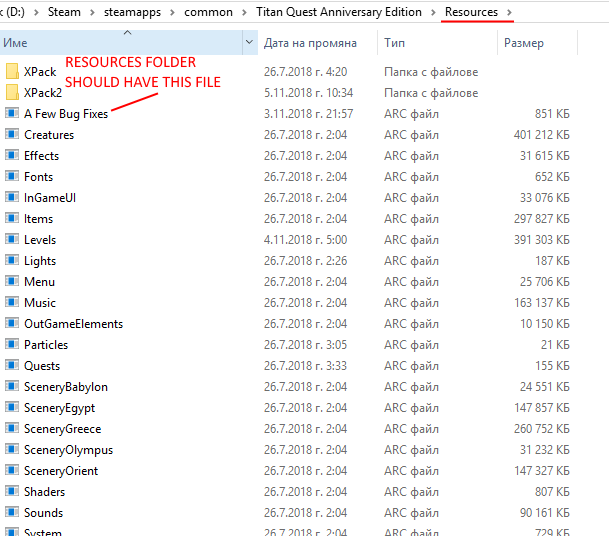 How to use: Place folder "Creatures" from the pack in "SteamApps/Common/Titan Quest Anniversary Edition/Database" folder for Steam users or "Titan Quest Anniversary Edition/Database" for GoG users. The skins will activate only when you load CaravanXL and won't conflict with any other mod. So for use with the main game, LoC, Xmax and M4ssboss3s mods I would use the main game download? There will be issue with XMAX and maxbosses i suppose, becuz their gamengine.dbr doesnt have increased inventory space. But i can try make a version that includes it. I'll update the description to explain whe difference. LoC works without problem. I plan to add more features to the mod when i have time, like portable caravan, item filters and MI showes affixes. Sometimes you just gotta march on Mount Olympus. Okay nargil66. I'll check the Xmax mod and see what I have in the AE version. Haven't played for a few months since I've been concentrating on GD so can't remember whether the version of the XL Caravan I have at the moment has larger space there or not. Bumbleguppy incorporated the larger Caravan into his LoC mod iirc. Not sure which version of it though. Same one. I didnt change it since the fixes. Yes, I do have a bigger personal stash in the caravan with Xmax. Transfer stash size is still the same though, so any way to enlarge that would be good. What version of Xmax are you playing? Give me a link, and I'll try merging the two. Not sure nargil66. Looking at the Xmax WinRAR file it was installed in June 2015, under the Properties in Archive it says version to be extracted 2.0 and the zipped file is 7.93kb. The AE version says the same for the version extract, but only 19.1kb zipped. It's XmaxTQAE version 1.42. What I have ingame is just the expanded storage that Nordic put into the AE version when they made it so that's what appears for Xmax as well. The link where you dowloaded i meant. Ok, I'll just download the Steam Xmax and try merging it. Here you go Medea, merged with Xmax. Downloded from KirmiziPerfect, same as Steam version. Wasn't sure which one you play, so I merged all. Tell me if there are any problems. 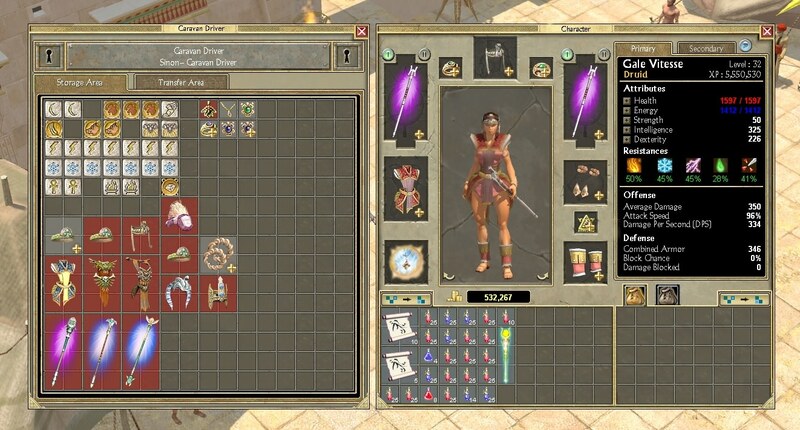 Updated Caravan mod for Titan Quest: Ragnarok. The mod is still beta, tell me if there are any issues. Edit: Download link updated, check on the next page. Formerly 'Nefer' of the tq.net forums. Awesome stuff nargil66! I'll definitely try it out thanks! Thanks nargil66. I'll try that out for Xmax asap. I have both GD AND TQAE on GOG, only have GD for playtesting purposes on Steam. I prefer non-DMR versions of games if I can get them. 1. DONT click on Rune mastery, choose some of the old masteries. I did that mistake and had to do a new character. 2. Bag buttons use the old vanilla icons. I'll fix this later today and update this post. 3. Start new character, just in case. I'll try tansfer Deities mod to new expansion anyway, maybe i'll find out what causes the invisible Rune mastery in LoC. Page created in 0.161 seconds with 31 queries.